Anne-Marie Kermarrec and Bruno Lévy. Anne-Marie Kermarrec, head of the ASAP (As Scalable As Possible - Foundation of Large Scale Dynamic Distributed Systems) research team at INRIA/IRISA Rennes, received the grant for her project GOSSPLE. The expected outcome of GOSSPLE are theoretical advances in large-scale distributed computing, practical advances in large-scale distributed systems, an innovative software to create dynamic autonomous networked systems and the ground for new kind of distributed collaborative applications. GOSSPLE has the potential of radically changing the navigation on the Internet by placing users affinities and preferences at the heart of the search process. Complementing traditional search engines, GOSSPLE will turn search requests into live data to seek the information where it ultimately is: at the user. Bruno Lévy, head of the ALICE (Geometry and Light) project-team at INRIA Nancy received the grant for for his project GOODSHAPE (Numerical Geometric Abstraction: from bits to equations), that involves several fundamental aspects of 3D modelling and computer graphics. GOODSHAPE is taking a new approach to the classic, essential problem of sampling, or the digital representation of objects in a computer. This approach will probably result in a new algorithm that is much more efficient in terms of algorithmic complexity and can be applied to a larger class of problems. Possible applications are for example inverse engineering and oil exploration. Both grants are in the order of one million euro over five years. 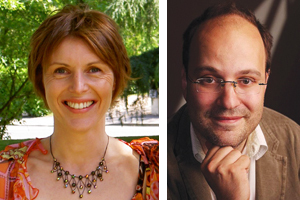 Anne-Marie Kermarrec and Bruno Lévy have been selected with 297 other researchers, among 10,000 applications in Europe, all sciences included. ERC Starting Grants aim to support up-and-coming research leaders who are about to establish or consolidate a proper research team and to start conducting independent research in Europe. The scheme targets promising researchers who have the proven potential of becoming independent research leaders. It will support the creation of excellent new research teams and will strengthen others that have been recently created.